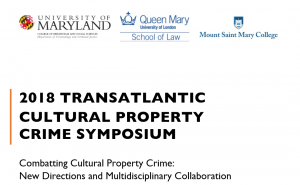 The 2018 Transatlantic Cultural Property Crime Symposium held on 28th and 29th June 2018 promised a varied and wide-ranging approach to current issues in heritage crime. It certainly did not disappoint on that score. The conference, organised jointly by Queen Mary University of London, Mount Saint Mary College, New York and the University of Maryland involved speakers from across the globe who tackled topics as diverse as the restitution of Mexican antiquities, carbon dating techniques, art crime as protest and the prosecution of unlawful salvage operations. A melting pot of perspectives was provided by those from law enforcement, archaeology, technology, political science, criminology and other disciplines. The first morning focussed on the broad area of conflict and cultural property crime. Delegates heard at first hand about the fight against theft and looting in Ukraine and the loss of cuneiform tablets from Iran. Both talks highlighted what came to be a familiar theme – the very limited resources available to fight heritage crime. And this is despite the links between the looting of cultural property and terrorist financing which has brought the issue into sharper focus in the global political agenda, as highlighted by Constanza Musu of the University of Ottawa in her talk on the ‘securitisation’ of art crime. The complexities involved in the restitution of stolen or misappropriated works of art was discussed by the next panel. Legal obstacles such as matters of title and ownership were highlighted by Kenneth Polk and Alexander Herman, with James Ratcliffe of the Art Loss Register emphasising the importance of seeking creative, negotiated solutions. All of these issues were demonstrated by the case study presented by Robert Kugler (of Höly, Rauch & Partner) involving the return of two 3000 year old Olmec antiquities from Germany to Mexico after a ten-year-long effort. The third session exploring ‘key concepts’ focussed in particular on due diligence, and how this is approached by the relevant legislative instruments. The theme was taken up in the final session of the day when Gareth Fletcher (Sotheby’s Institute of Art) compared approaches of auction houses, museums and dealers. It was more the absence of diligence which was highlighted by Samuel Hardy in his exploration of the vast evidence available online which indicates a worrying underworld of illicit excavation and trade in cultural artefacts. The second day opened with a session exploring new techniques for detecting art crime after which some ‘real life’ examples were shared by Charley Hill (Art Crime Researcher, Retired London Metropolitan Police Officer). PhD candidate, Richard Van Heerzeele shared his interesting research on the multi-layered web of entities involved in the ‘pluralised policing’ of art crime, including not only law enforcement agencies but private investigators, insurance professionals, security providers, museums and galleries, NGOs and others. The role of security professionals was explored in more depth by William Brown (National Security Adviser, Arts Council England) after which a panel addressing the topic of cultural heritage protection took the floor. The work of two key UK agencies in this regard were described by Adam Daubeny (the Portable Antiquities Scheme) and Mark Dunkeley (the Maritime and Coastguard Agency). The conference concluded with an examination of the connections between international art crime and money laundering. The theoretical models proposed by two of the speakers were brought to life by some examples provided by Brazilian case studies and, in the final session, by the exploration of patterns of fine art theft in the US by Kate Melody Burmon of Mount Saint Mary College, one of the conference organisers. The range of perspectives covered by the speakers over the two days of talks was impressive and provided plentiful food for thought. Key themes which emerged included the need for: a collaborative and multi-disciplinary approach to heritage crime; creative solutions which look beyond the strictures of the law; progress towards a common set of definitions and standards; increased vigilance of the online environment. No doubt the connections and networks established during the symposium will continue to grow. Through such collaborations, perhaps we can start to develop proposals for solutions to some of these difficult and complex challenges. This entry was posted in Anti-Money Laundering Act, Antiquities, Art Market, Art Theft, Conferences, Conflict, Criminal Law, Cultural Heritage, International Art Transactions, Restitution, Seminar, United Kingdom, United States and tagged art crime, Art Theft, criminal law, cultural property crime, law enforcement, money laundering, securitisation, transatlantic, UNESCO 1970 Convention on July 1, 2018 by Emily Gould.